on May 21, Michael Brantley hit a 2-out, 2-run single in the bottom of the 2nd inning, giving him an 18-game hitting streak at home. that also tied Michael for the longest hitting streak at Progressive Field by an Indians player. at that time, he shared the home hitting streak franchise record with Roberto Alomar, who last achieved it in 2000, and Kenny Lofton, who achieved it in 1996.
unfortunately, the next home game was not scheduled until May 30, so i had to wait all that time to find out if Michael would in fact break that franchise record and set a new one. so this blog may seem like it was posted very late, but i wanted to see if i could blog about Michael setting a new franchise record, rather than him just tying the record. during Michael's record breaking home hitting streak, he hit .408 (31-for-76) and recorded 18 singles, 7 doubles, 6 home runs, and 20 RBI with 19 runs, 7 walks, 1 hit by pitch, 4 stolen bases, and 56 total bases, while only recording 3 strikeouts (swinging) and 1 GIDP. also during this streak, he tallied 4 of his current 6 outfield assists. breaking into the history books and going back to the days of the Tribe at Municipal Stadium, the last player to have a 19-game home hitting streak pre-Jacobs Field was Julio Franco. he recorded his streak from June 8-22 in 1984. Michael's next task will be to try and break the longest hitting streak in Progressive Field history by any player who is not an Indian. 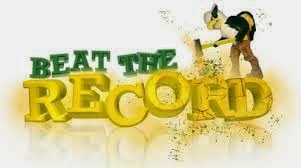 that record currently stands at 22 games and is held by Elvis Andrus of the Texas Rangers. and i like Michael's odds. 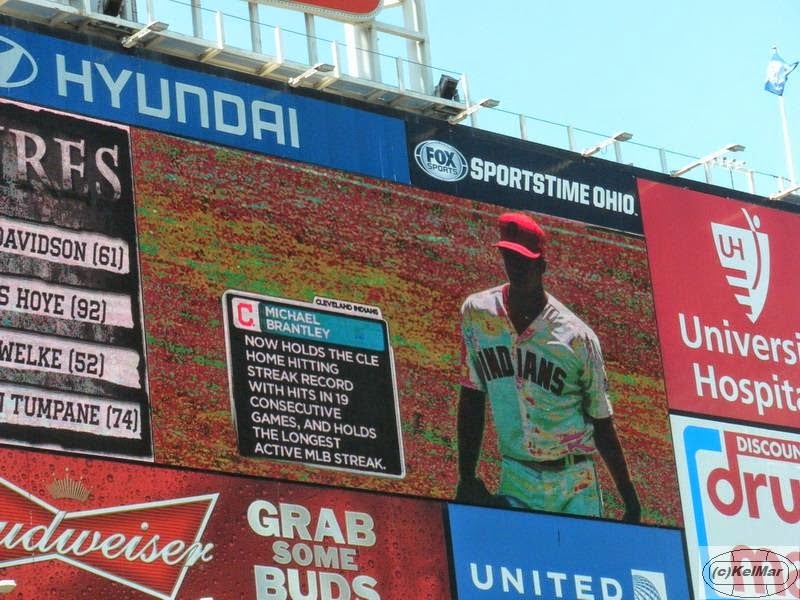 so congratulations to Michael on setting yet another new record for himself and the Indians! remember, his first franchise record was set earlier in April with his 247 consecutive errorless games in the outfield, and he's set a second record now with this home hitting streak. something tells me there are more records to be broken by this man, whether franchise or career highs for himself, as Michael continues to play like an All Star and MVP this season. 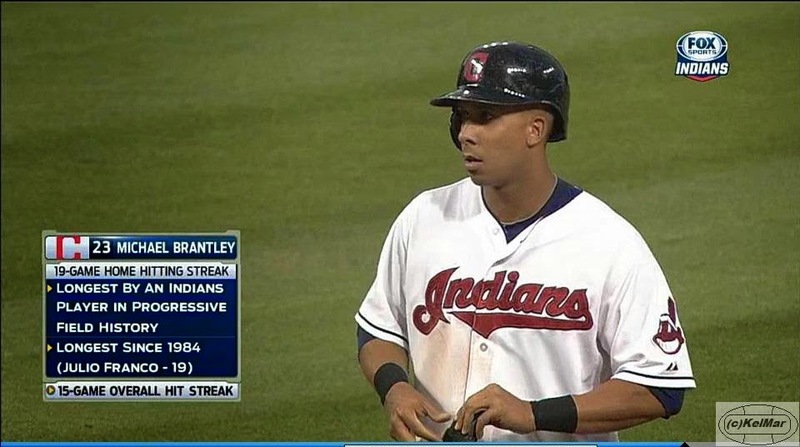 Brantley's First Career Walk-off Home Run!